These images and video of a young lady who was fatally injured while dancing (twerking) has gone viral. 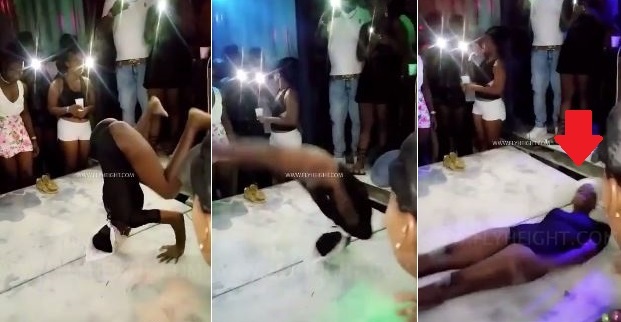 In the video below, the lady in question is seen doing the "booty bouncing" twerking while her head was on the floor, She lifted her legs into the air and as soon as she feels she’s found her balance, she raises her legs higher and begins to twerk until she rolled over and her neck slipped painfully and wrongly. If the comments attached to the video is to be real, the girl is dead, though many others are saying she is completely paralyzed from her neck downwards.